New experiences can be exciting, but they can also be pretty scary until you understand what is going on and get used to them! After all, it is knowledge that destroys any fears we have. As soon as we learn about how something works, or what it is, then fear can no longer hold control over us! Alas, how on earth do you explain to a pup that the ocean isn’t scary? 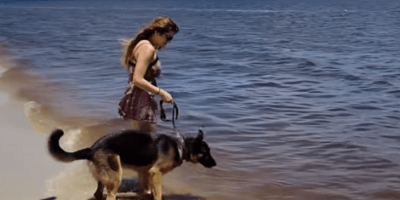 This Mom and Dad are out on a day trip to the beach with their German Shepherd pup, who is experiencing the water for the very first time. Most of you would notice just how calm the waves are – surely this pup can’t have any problems, right? Initially, it would seem so. This pup has two front paws in the water and is checking everything out. Then, he makes a fatal mistake – he tastes the seawater, and finds it horribly salty! Just what kind of water is this? !